I have a love/hate relationship with puzzle games. (I’d rather engage with something that allows me to play expressively.) But I love strategy games and a few puzzle games. 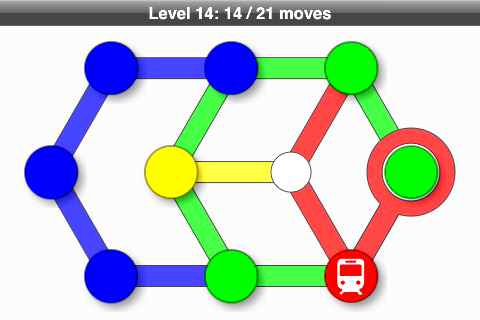 Subway gameplay involves moving pieces around to open a path to the goal. Each level (01-91) gets increasingly difficult. The part I find fascinating is my approach to solving the puzzles. There’s an interesting mental shift, where I “let go” of trying to solve the puzzle overall, focus on which moves I *can* currently make, take into account what has to happen (in the final move) to solve the puzzle, and *try to solve faster*. I find that I’m far more successful when I make this series of mental shifts than when I try to approach the puzzle as a whole, or in a systemic way. Hard to articulate. Subway also has a super clean art style and implementation that I love. This game has made it onto my list of iPhone favorites, along with Galcon and Drop7.